I was feeling rather out-of-sorts today. Between work commitments and some fairly severe weather, it’s been a long time since I’ve been able to get out and enjoy the winter scenery. Today started out with that old “trapped” feeling — call it cabin fever — but as the snow stopped (for a while) and the temperature rose to a toasty 15F, we made our escape. Visiting the beautiful Brecksville Reservation of Cleveland Metroparks was a life-giving tonic. Deep, pristine snow covered the ground and evergreens. Snow lined the branches of winter-bare trees. Chippewa Creek, deep within its rocky gorge, was ice and snow covered, softening its rugged beauty. Soft light filled the quiet woods. We trudged along a path breathing in the clean, cold air, soaking in the beauty of the day. Camera in hand, I shot a few photos along the way (more than I thought … 90+ pictures) and that contributed to the experience. We couldn’t stay out for long, as She Who Must Be Obeyed was getting painfully-cold toes, but it was long enough: a good dose of spiritual tonic. 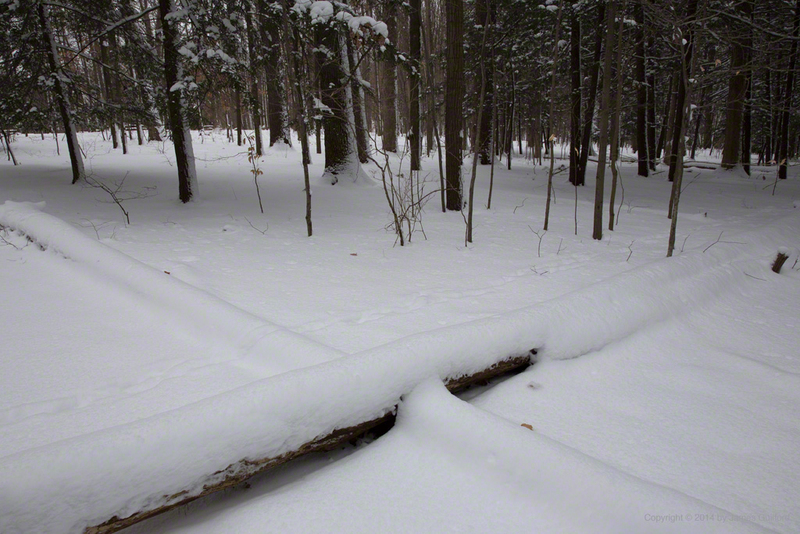 The fallen trees lie crossed at a nearly exact 90-degree angle and the snow was soft and perfect, indeed!